Disclosure: We participated in the media weekend at Great Wolf Lodge. All opinions are my own. I feel like I am coming out of a dream. 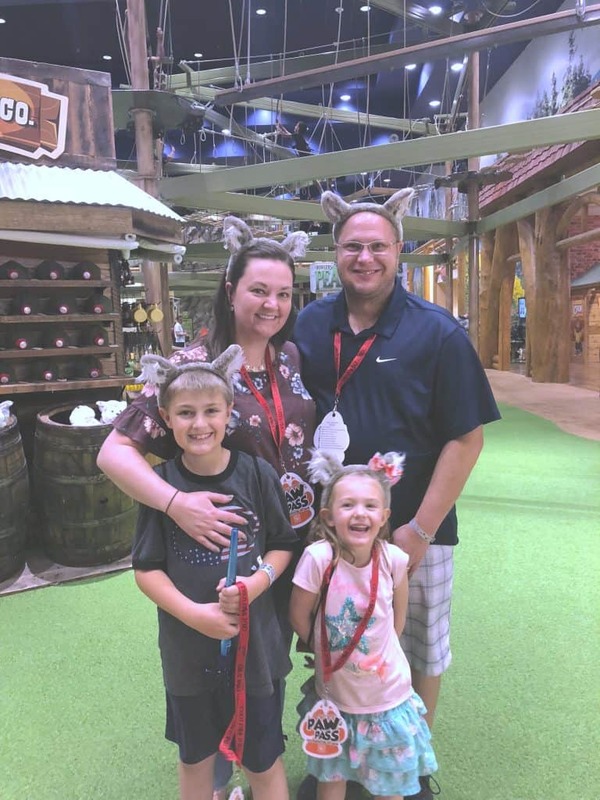 This weekend our family was invited to stay at Great Wolf Lodge in Colorado Springs and treated to some absolutely incredible experiences. 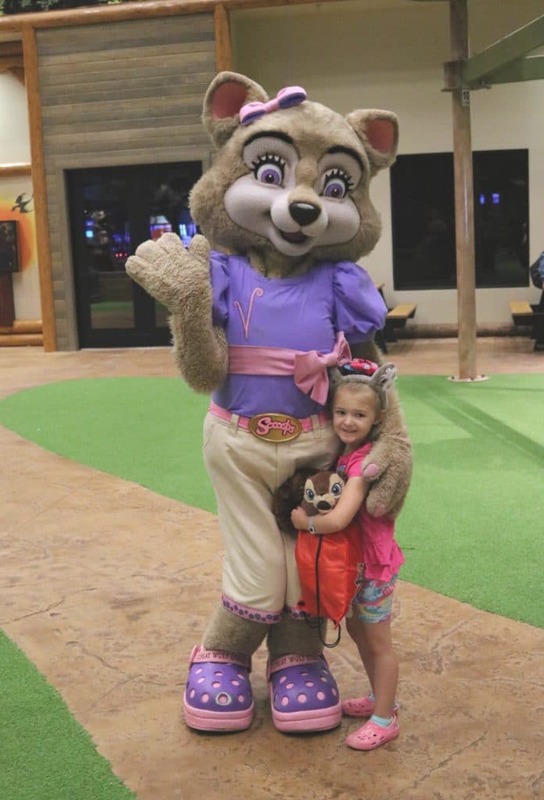 I wanted to share everything that first timers need to know about Great Wolf Lodge! 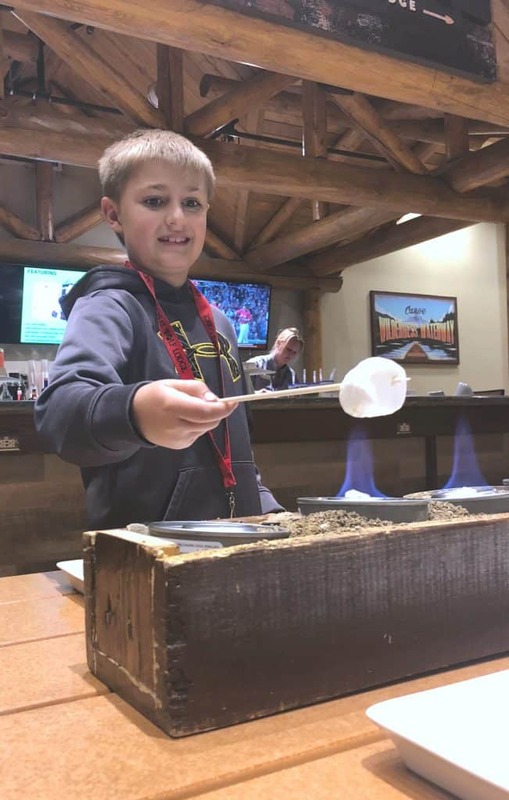 When we arrived at Great Wolf Lodge, the front desk staff reminded us about the s’mores mixer and gave us an event schedule so we were aware of everything that we could participate in for our stay. It was all included in the stay for no extra cost and we had a great time. The s’mores mixer was a private event for the media, but there were plenty of other events for the public that were awesome. 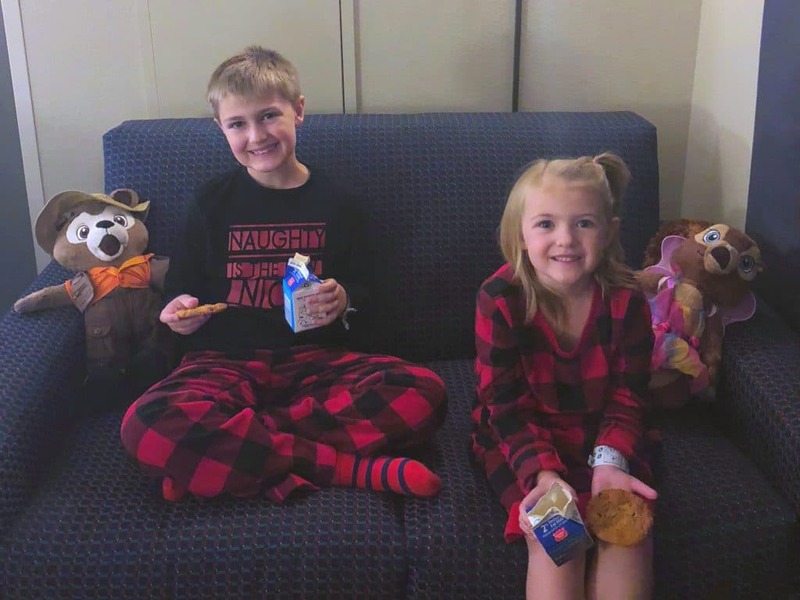 Our kids really enjoyed hanging out for storytime, doing yoga while waiting to be sat for breakfast, getting their faces painted, watching the various forest friends shows in the lobby and of course meeting the characters. 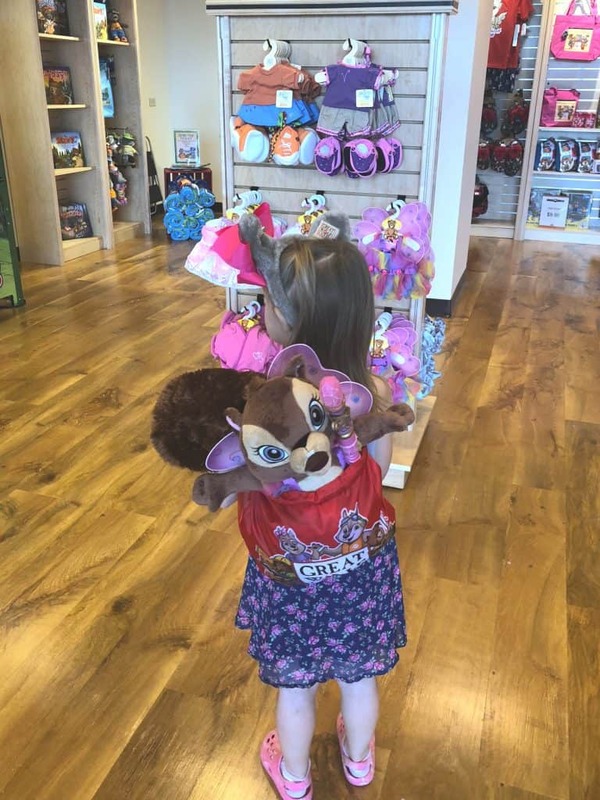 Also, I cracked up that Violet the wolf had crocs on and so did our little one! 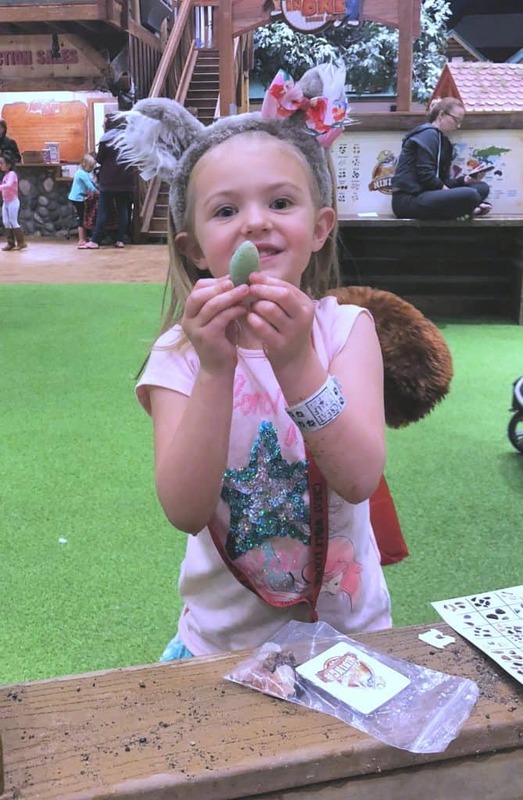 The activities and events that they offer throughout the park are a fantastic way to entertain your entire family and honestly they were not packed at all. Violet walked right out and took photos with children and families without a line. My kids only waited about 5 minutes to get their faces painted and storytime was just a quick sit down in the main lobby. Every person that we saw at Great Wolf Lodge had some sort of Paw Pass. These are passes that you pay for in addition to your stay that include packages of various activities available on the property. 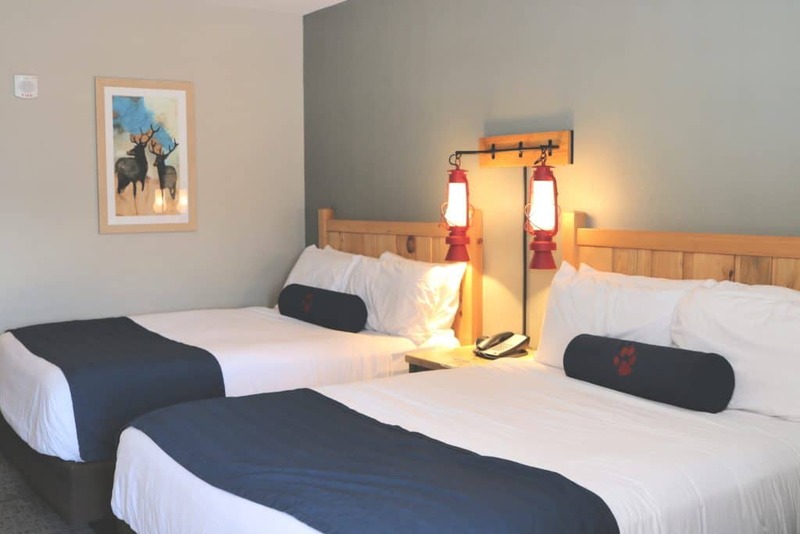 We had the media Great Wolf Lodge Paw Pass which was a combination of the Wolf and Paw passes. There is also a Pup pass that is available. 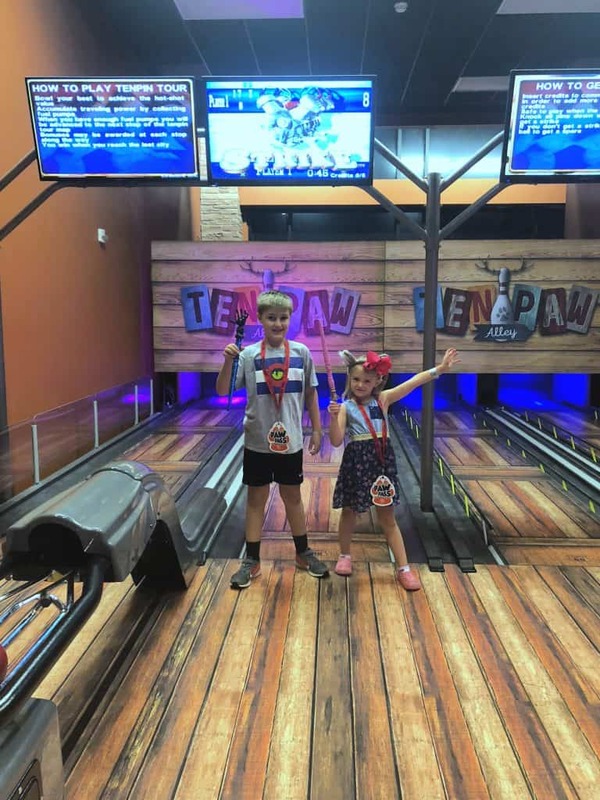 You can see that one one side of the pass there is the logo and on the other side there is a list of activities that you can do with your Great Wolf Lodge Paw Pass. As you complete them, the staff marks the Great Wolf Lodge paw pass. They have passes for every price range and each offer great options of activities to choose from. You can learn more about the passes and activities that are offered here. Our passes included nearly every activity in the park and we did ALMOST all of them. The first activity that we had to do was the TenPaw bowling. Fun little fact about my husband and I is that we met at a bowling alley, so of course we had to do this first! I recommend doing this after breakfast before hitting the pool, as it gets busier during the evening hours. We definitely had a great time and would have spent a few hours there if we had more time. Next on our activity list was the Creation Station. 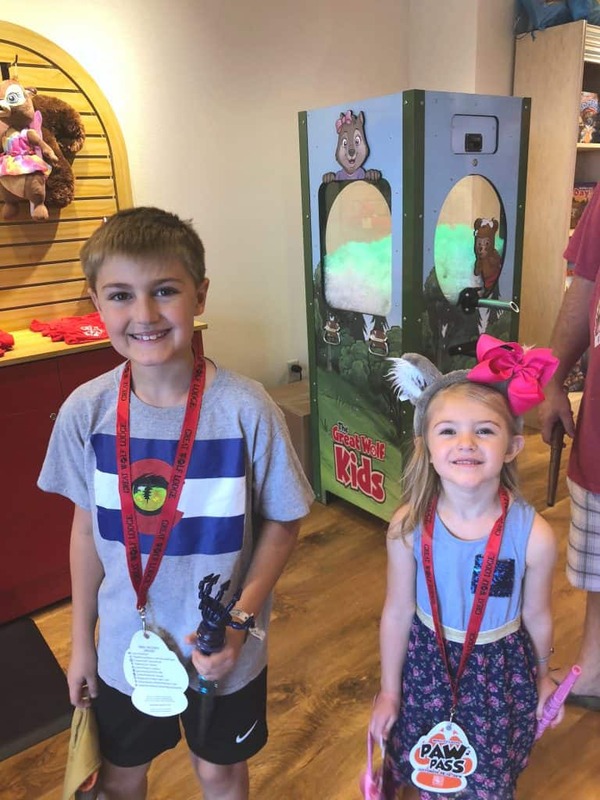 Before heading to Adventure Park where most of the activities are, you pass right by Creation Station and of course our kids were so ready to build their own Great Wolf Lodge characters. 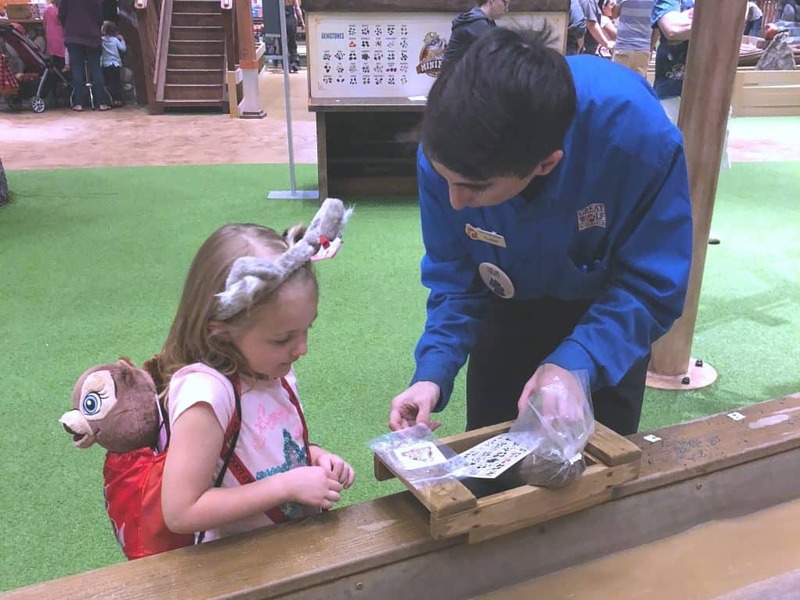 The staff was great, the kids loved the experience and I loved that each animal came with a little drawstring bag to carry it (and basically everything else) in. The kids also enjoyed mining and panning for rocks and minerals! We each were able to do this and we found some really pretty rocks which our kids were super excited about! 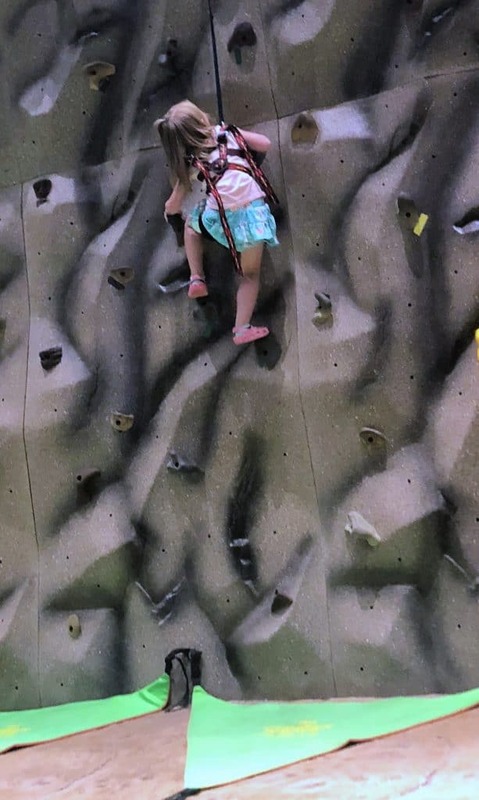 In addition to panning for those rocks, the little one decided to try her hand at the rock wall. She didn’t make it too far, but she gave it her best. One thing that we learned here was that you need to have on shorts or pants (her skirt had shorts under) and that you must have closed toed shoes to participate. The one activity that our family did not do was the ropes course because our daughter was just not big enough and our son is going through a fear of heights phase. However, that ropes course looked amazing and hopefully next time we can all give it a try. 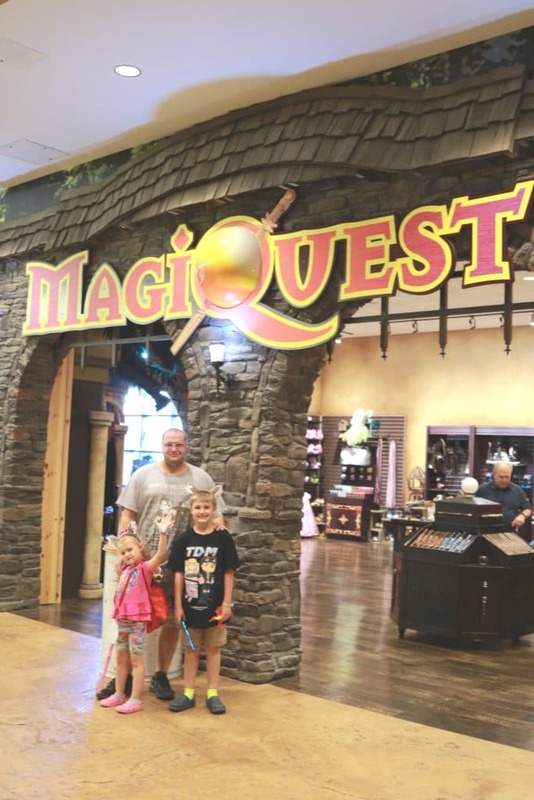 The water park was amazing and all those details are coming, but can I tell you that I think we spent just as much time playing MagiQuest as we did in the pools! I was not expecting this to be as much fun and exhausting excitement as it was. 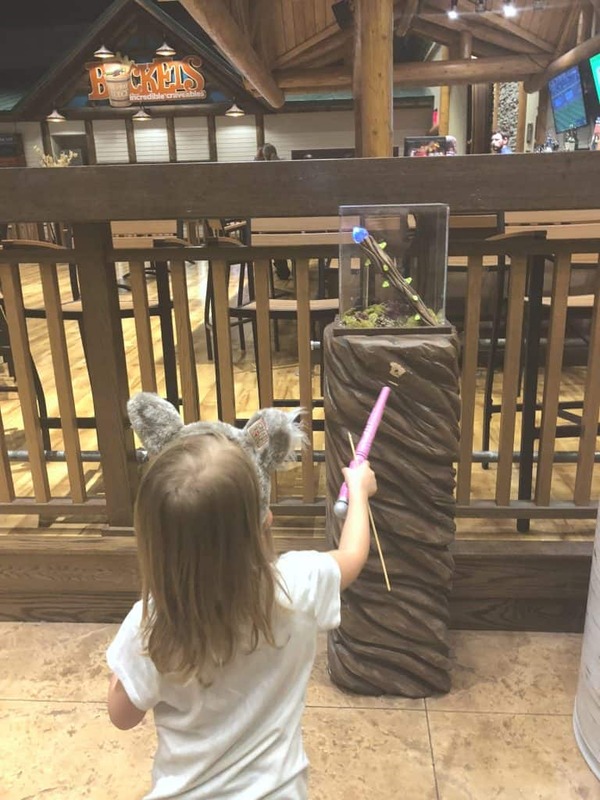 Our Great Wolf Lodge Paw Pass came with a MagiQuest wand and game and the minute we started playing it was game on! MagiQuest is basically one really big puzzle scavenger hunt! You collect various items in a specific order and then use those items to battle dragons, goblins and rescue princesses and pixies! I was not expecting to run around the resort so much or to become so obsessed and competitive, but it was SO FUN! …is when we ALL became MasterMagi! It took about 5 hours total of work over 2 days, but we collected all the items, battled the dragon and goblin and rescued the pixie. 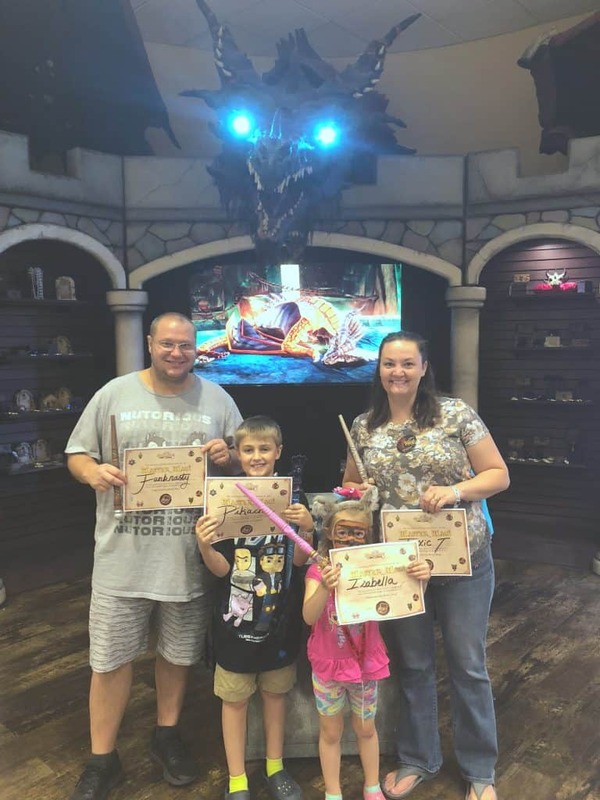 They then announced our accomplishment with certificates (including our wizard names we chose at the beginning), gave us a button and displayed our names on the screen for everyone to see! It was no small feat, but it was an incredibly fun memory maker! 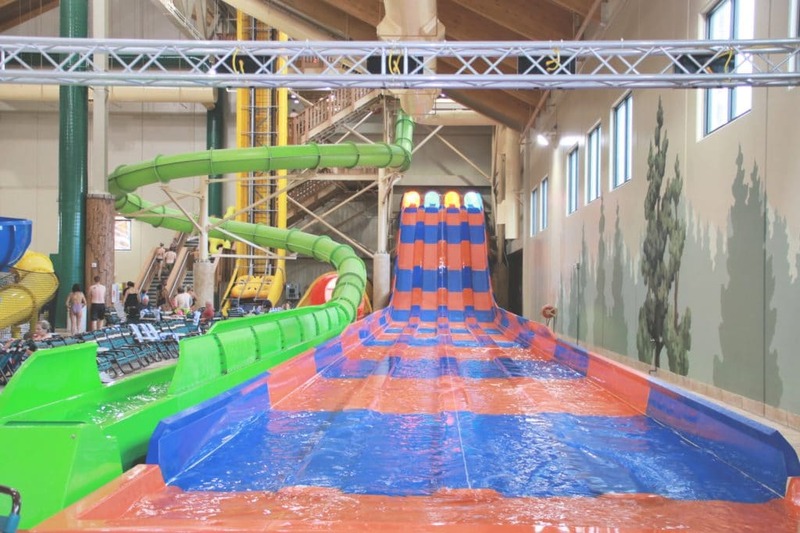 Great Wolf Lodge’s main attraction is the indoor water park and they do right by this. Our kids could not wait to get into the park. The evening that we arrived it was too late to go swimming, so the next morning they were ready to jump in and jump in they did. 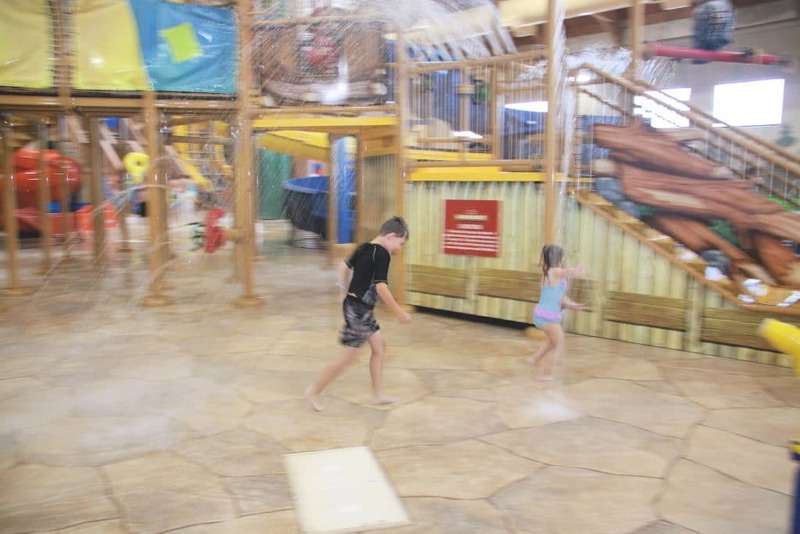 From Fort Mackenzie with small waterslides, lily pads, basketball, rock wall, fountains and more, to the BIG slides and racers, the water park was everything we imagined and more. We truly expected it to just be slam packed in there and honestly it really wasn’t. We were able to get on rides with short wait times of about 5 minutes, the kids never were bored or complaining and getting them out of the water was nearly impossible. There were a few areas that we did not go into, like the Whooping Hollow for the littles and the Howling Tornado because our kids were just not the right sizes for these rides and spaces. But that was not even an issue, because there was so much that they were able to do and it was awesome. My husband and son were 100% obsessed with the wave pool! They spent nearly 3 hours in it together. I seriously just loved watching them take those waves on and laugh and enjoy building those memories. I also LOVED that Great Wolf Lodge encourages floatation devices and allowed us to being our US Coast Guard approved floatation devices in. My daughter flourished in Fort Mackenzie and Totem Towers. I have never seen her smiles so big. She was in her element and enjoying every moment of the water park. I had a hard time keeping up with the two of them, but I enjoyed every second of splashing and playing and sliding with them. We even had space to work on our swimming and water treading in the Chinook Cove which was surprisingly really calm. I would have to say that my favorite part of the water park was Alberta Falls. You guys, I screamed so much that I am 99% sure that the people at the bottom of the slide were clapping because they too were glad I lived. I wish we would have had someone taking pictures at the bottom of this slide, because it had to be hysterical to watch us shoot out the bottom and record speeds. The husband and I were definitely on the upper end of that weight limit and we were FLYING! The waterpark alone is worth every single penny. You could actually spend the ENTIRE day here and be fed, take naps, have a drink and play until you cannot physically move anymore! 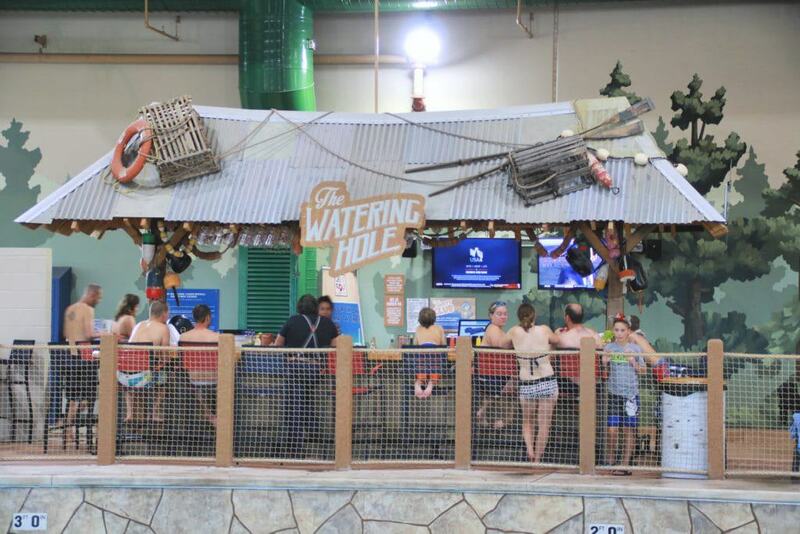 There was not one single kid or adult that wasn’t enjoying the heck out of Great Wolf Lodge. 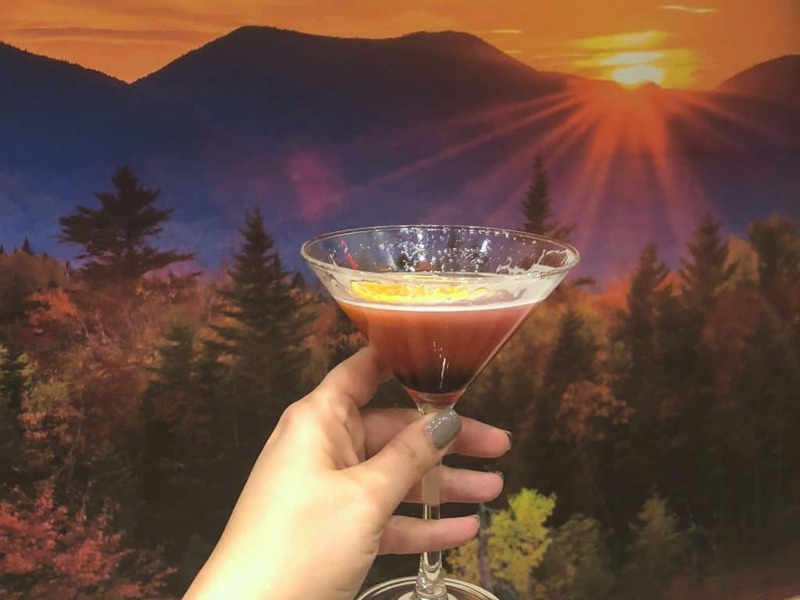 Food and Drinks that will Leave you Wanting More! I fully expected there to be a few places to eat on site, but what I wasn’t expecting was that they had bars on site too! My husband and I are not big drinkers, but we definitely tried a few of their cocktails and the other adults were also enjoying adult beverages in moderation. This blood orange martini created by Paul the main bartender there was heavenly. People also were drinking in moderation and everyone was really respectful and just relaxed. We ate at ALMOST every single restaurant on site. 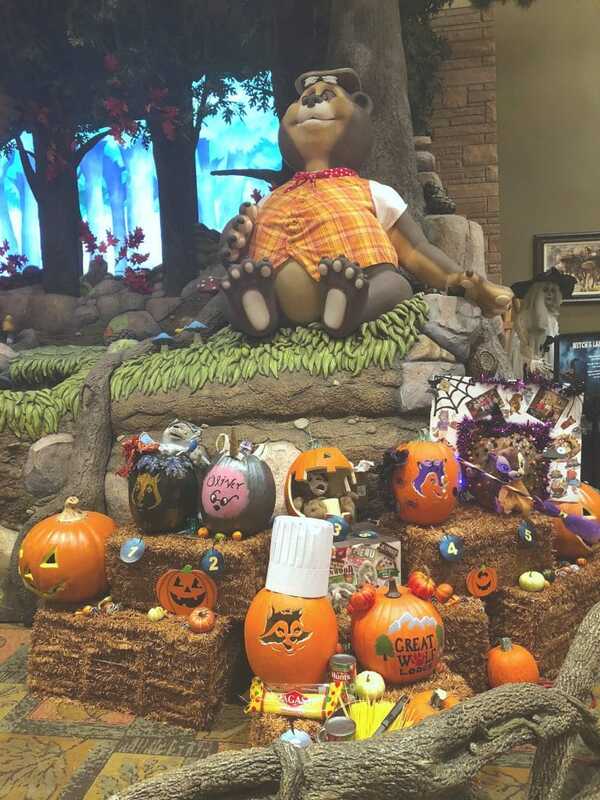 Although the hotel does allow you to bring in your own food, we were able to enjoy meals throughout Great Wolf Lodge. 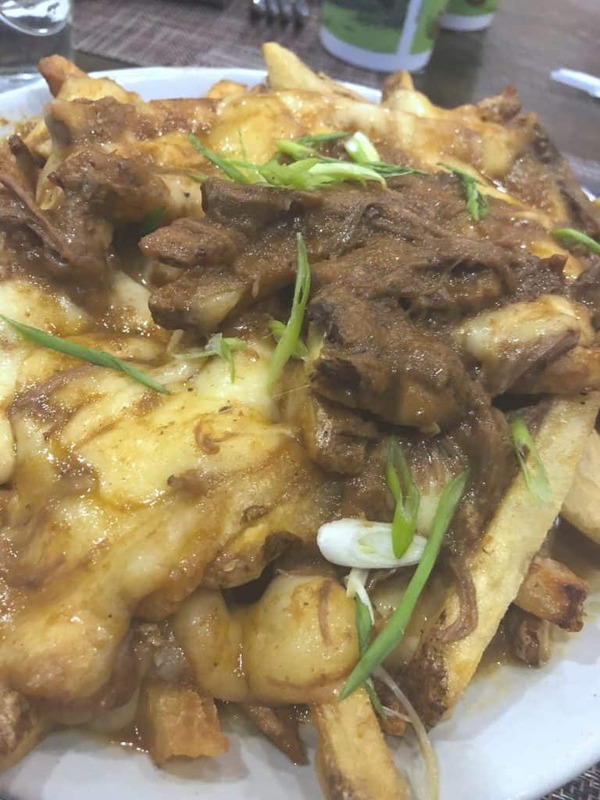 From buffet style breakfasts at The Loose Moose Family Kitchen to lunch at Buckets to the most scrumptious dinner at Barnwood, our dining experiences were awesome. 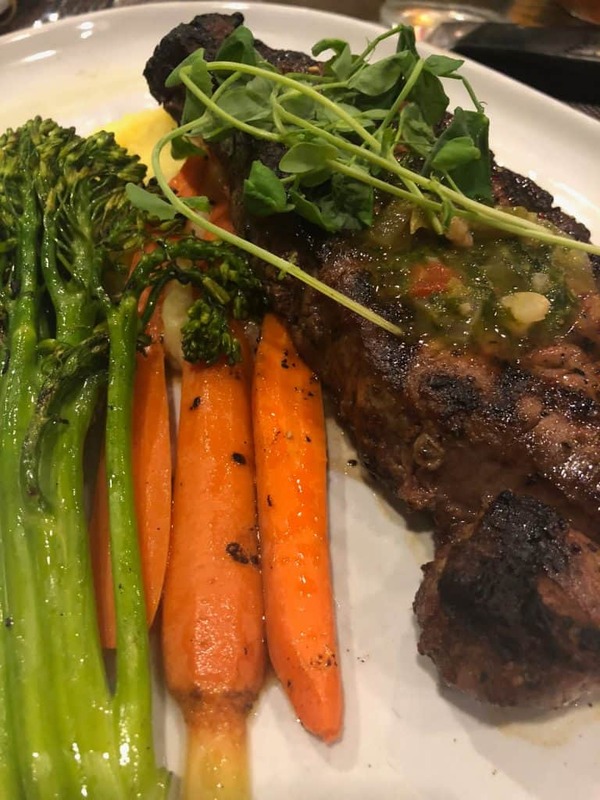 I will say that the food quality is locally sourced and the prices reflect that, but that everything we ate was exceptional. In addition, our service was impeccable. I truly believe that the staff at Great Wolf Lodge enjoy their jobs and most were not aware that we were media, they were just doing what they do best! Of all the meals we ate, our favorite was at the upscale, locally sourced restaurant, Barnwood. From appetizers like the pork poutine a couple photos above to the incredible NY Strip steak, we were in heaven eating. This place was a bit pricey, but you get what you pay for and our food was fresh, delicious and cooked to perfection. Our room was a deluxe queen suite. It was decorated in that log cabin feel but was perfect for us. My husband tried to convince the room staff to let us take the mattress home because the beds were THAT comfortable. Everything was SUPER clean (believe me, I am that person that checks) and the room staff was great about getting us anything that we needed. In fact, upon arrival I received a text from our “personal assistant” Brinley that I could text if we needed anything. Talk about customer service. We were lucky enough to be showered with some specialties for the weekend. One of which was a wolf basket full of goodies from the Great Wolf Candy Company! However, our favorite was the Wine Down service that we were treated to after a long day of MagiQuest and swimming! 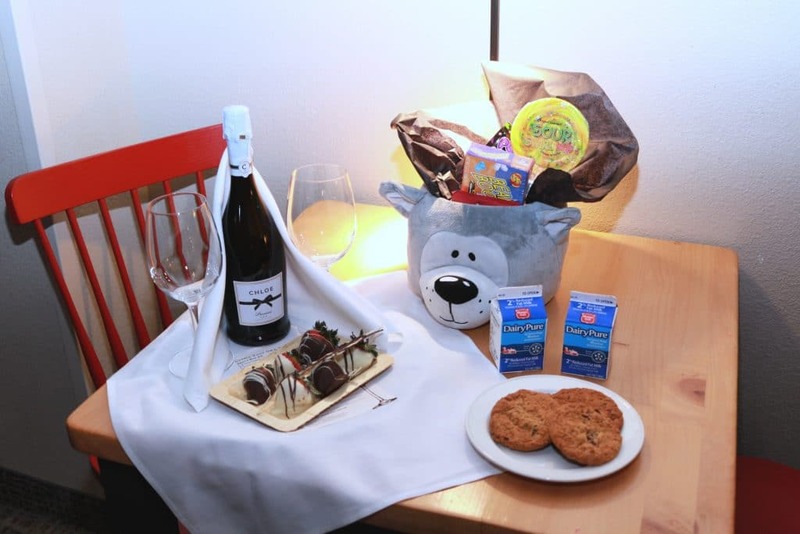 We walked into our room to find chocolate covered strawberries and wine for the adults and cookies and milk for the kids! Talk about a way to end the evening on high note. As if my kids were not already feeling super special, this was the topper to the evening. The wine down service was amazing, but only in Colorado at Great Wolf Lodge can you get views and sunsets like this. 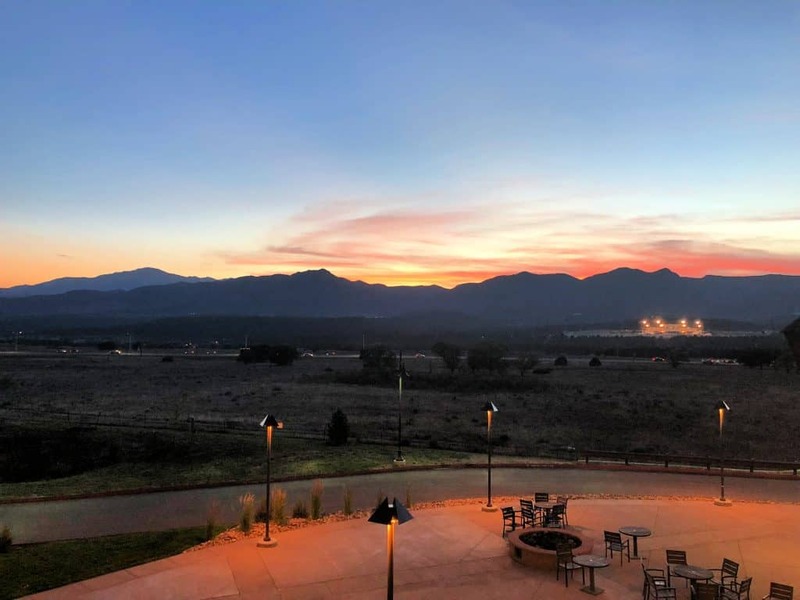 I would honestly argue that they have the best views of any hotel in the state, with the Air Force football field and those beautiful Rocky Mountains right outside their front door. It was STUNNING! 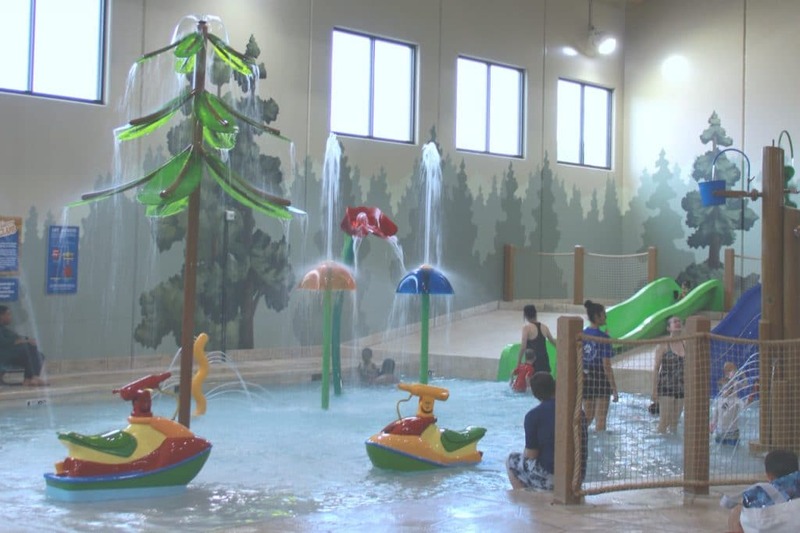 If you are looking to make a visit to a Great Wolf Lodge but are not sure which one to go to, Colorado’s is obviously the best. Our views win and couple that with the activities, amenities and amazing customer service you cannot go wrong. It was an absolute blessing to be in that place with our family, making those memories. 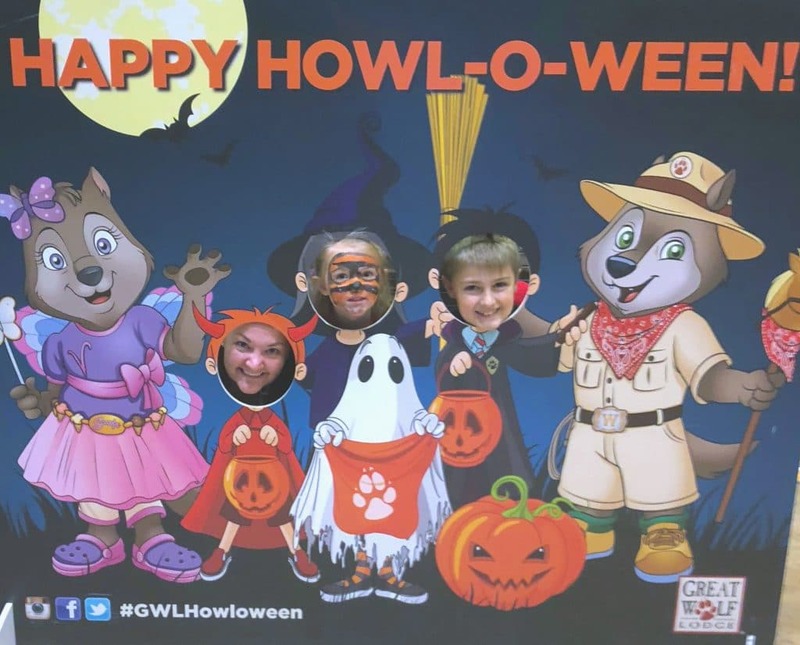 One of the events that we are really hoping to go back for is the Howl-O-Ween celebration that takes place all month long at Great Wolf Lodge. 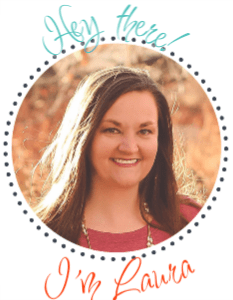 We were lucky enough to see some of the holiday decor and learn a bit about the happenings of this awesome month! Featuring a spooktacular storytime, costume parades, monster dance bash and yes, a trick-or-treat trail, this month long event is sure to be a hit with your family. They have a ton of events and special activities for families to enjoy during this event. We even found out that instead of the standard wolf ears that every guest is treated to, the ears are orange and are a hot commodity! Although we missed the start of Howl-O-Ween, we were still able to enjoy the decorations and have a little fun of our own taking photos, and getting some silly scares in as we trekked through the property. 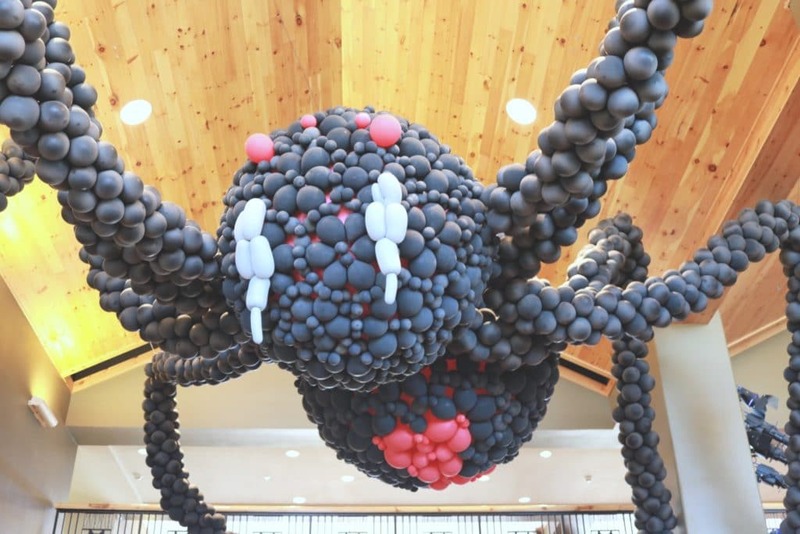 This MASSIVE balloon spider was probably the most impressive decoration I had ever seen. It fills the entire ceiling of the grand lobby and IT LIGHTS UP! You guys, the detail on this spider was so cool and really set the tone for what is sure to be a rocking Howl-O-Ween! We just have to go back! 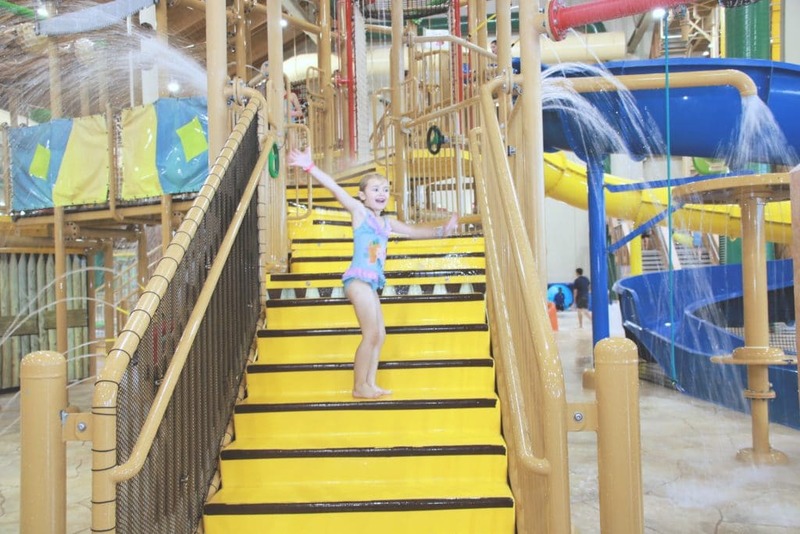 We have nothing but great things to say about our experience at Great Wolf Lodge. It was top notch and honestly one of the best family getaways we have had. Our sentiments were echoed throughout the property. Every parent we spoke to felt like they got their money’s worth and that they were having the best time! 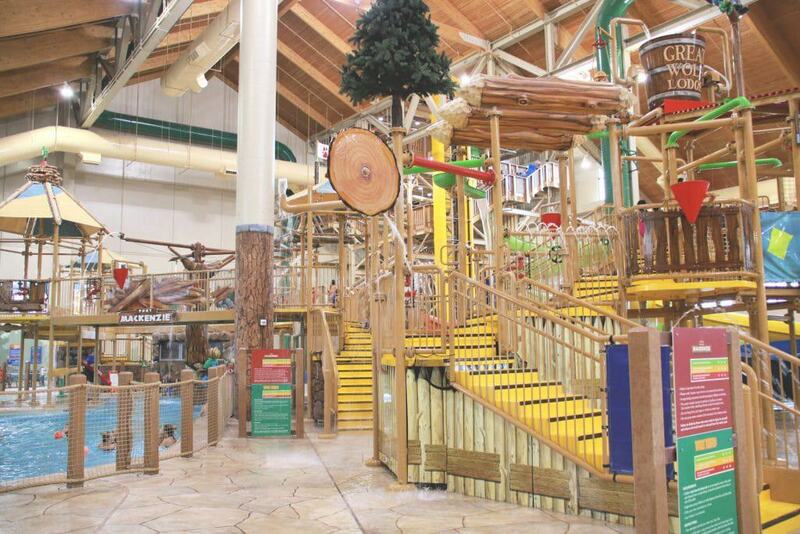 Have you visited Great Wolf Lodge? Tell us about it in the comments! Interested in other fun activities to do with the kids? Check out our experience with the Bippity Boppity Boutique. 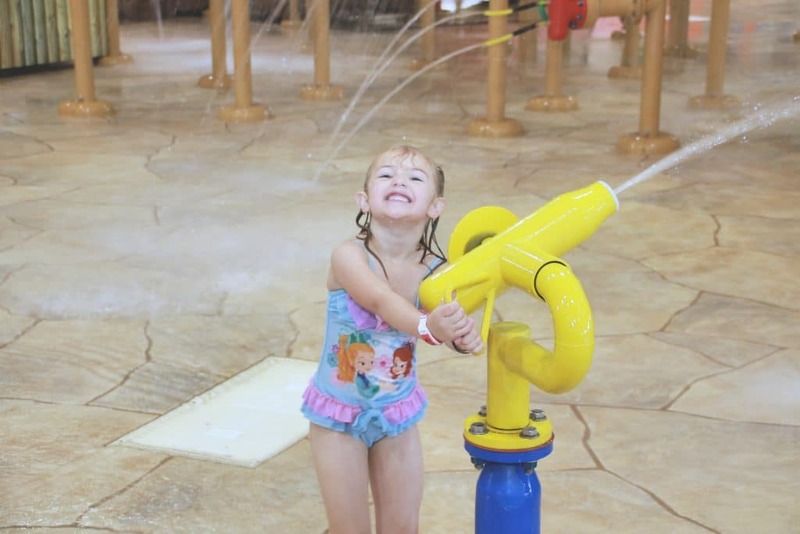 Love all that there is to do at Great Wolf Lodge! We went when my son was younger and he had a blast! It is so amazing! We are totally going back soon! Awesome! You did a fantastic job and we loved it! Excited to see next years for sure!